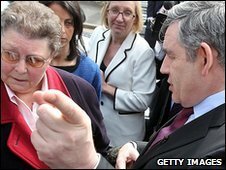 The woman at the centre of a media storm after being called "bigoted" by Gordon Brown has said she will not be voting for Labour or any party. Gillian Duffy told the Mail on Sunday she felt sorry for Mr Brown after he made the unguarded remark, minutes after she confronted him in public. Mr Brown later visited Mrs Duffy's home in Rochdale to express his regret. Mrs Duffy said she accepted his apology but declined his invitation to shake hands with him in front of the cameras. "He wanted me to go outside with him and shake his hands for the camera but I said no," she told the newspaper. "I didn't want that fuss." Mr Brown's remarks - in which he described his discussion with Mrs Duffy on issues such as immigration and education as a "disaster" - were captured by a microphone he was still wearing. A life-long Labour supporter, Mrs Duffy said she was "shocked" by the episode and felt more "sad" than "angry" about what happened. All she had done was "ask questions", she told the paper. "Does that make me a bigot? ", she said. "If you are going to go and talk to people you should have answers, shouldn't you? You don't just go there and shake their hands and tell them how well they are doing." She added: "He was smiling when he spoke to me but he was thinking that. What else is he thinking when he smiles." Reflecting on Mr Brown's visit to her house, she said she had told him: "I'm sorry for you, Gordon, because you have more to lose than me. I'm very sorry that this has happened but it's you who's going to lose out not me." After the incident, Mr Brown said he had "misunderstood" what Mrs Duffy had said and thought that she had been talking about sending students from Eastern Europe back home. Mrs Duffy said she had never said anything of the kind. She said she wished Mr Brown had never "bothered" coming to Rochdale in the first place. Immediately after she was told about Mr Brown's remarks, Mrs Duffy suggested she would not be voting Labour as she had previously intended. She told the newspaper she could not "bring herself" to vote at all after what she had gone through. The interview is the first public comment she has made since the prime minister spent 40 minutes in her Rochdale home - ripping up his campaign schedule in the process. After the incident, Mr Brown told Labour members that he "profoundly regretted" the remarks and has since acknowledged he has paid a "very high price" for them. Writing in the Sunday Mirror, Sarah Brown said her husband would "forever regret" his remarks. "I was not with Gordon at the time but I could tell from the tone of his voice when he called me that he had done something he felt mortified about," she said. "If there is one thing everyone who knows him agrees on about Gordon, it is that he simply hates upsetting people. "The idea that somebody would have been caused pain or embarrassment by something he had done is the sort of thing that goes right to the core of Gordon and I know that his apology came straight from the heart."